Zhengzhou Kehua Industrial Equipment Co., Ltd. Product Introduction Charcoal powder press briquette machine/coal dust for briquetting There are many types of charcoal powder press briquette machine/coal dust for briquetting in our you tell us your raw material we will recommend the most suitable charcoal powder press briquette machine/coal dust for briquetting to you. 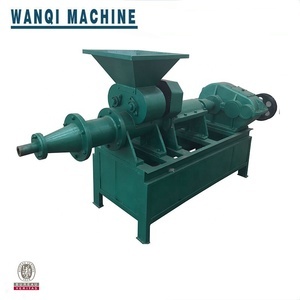 Working Principle The working principle of Charcoal powder press briquette machine/coal dust for briquetting Charcoal powder press briquette machine/coal dust for briquetting will pass the power on to the two pressure roller through the reduce. Charcoal powder press briquette machine/coal dust for briquetting can not only pellet iron ore powder but also other lots of material such as charcoal fines, coke powder, coal fines, cast iron fines, mill scale and other powder material. Production feature of charcoal powder and coal briquette machine 1.To make the coal and charcoal powder into different pellet. ,Ltd Our factory is a professional manufacturer of charcoal making machine, carbonization furnace, dryer machine, wood working machine and construction machine, etc. The biomass briquette machine, a charcoal briquette machine, a coal briquette machine, shisha charcoal machine are become our popular product in the global market. S o its working process is stable, service time is long, operation is easy, etc. l In order to give you the quotation in time,Pls. tell me the answer of the following questions. Henan Zhangsheng Environmental Protection Equipment Co., Ltd. This equipment production of the coal rod can be widely used in ammonia fertilizer factory, gas plant, chemical fertilizer plant, boiler fuel, and other enterprises. Features and advantage of Coal briquette machine I n the forming process it works without adding lime, greatly reduces the fuel cost of investment, and coal rod calorific value is high , thus leading to the economic benefit is high. W ith cheap pulverized coal and other production type coal instead of the market price of coal,the machine can reduce the production cost and supply the reliable guarantee for improv ing the economic benefit . 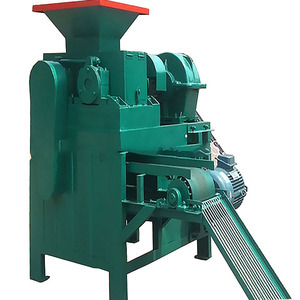 Working principles of charcoal powder ball briquetting press The charcoal briquette machine will pass the power on to the two pressure roller through the reducer. 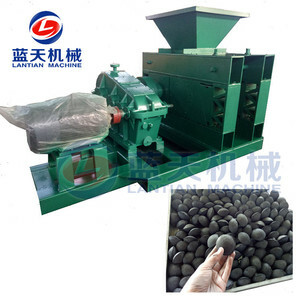 Raw material of charcoal powder ball briquetting press 1.Raw material size should be smaller than 5mm. Final product of charcoal powder ball briquetting press The final coal ball or charcoal ball is mainly used for boiler heating or used at home for cooking, BBQ. Henan Sharing International Trade Co., Ltd.
A fter molding by ball press machine, the material feature is energy saving and environmental protection, convenient transportation, improve the utilization rate of waste, have good economic benefit and social benefit. 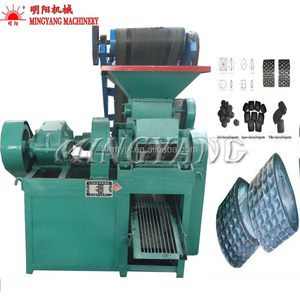 The two sides and roll rotation, in both the rotating roll, Natural materials to enter the briquette roll mode, with the roll rotation, material pressure on a small become larger, When the material to the two rollers rotating line contact point, the pressure of materials has reached the peak. , Ltd is mainly specialized in lignite charcoal briquette machine and hydraulic briquette machine and ball press machine and Coal powder molding equipment is a joint-stock enterprise integrated R and D, manufacturing and marketing.